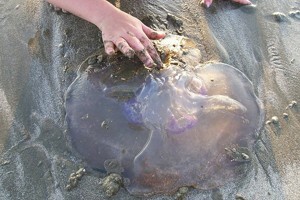 If observation of the shape and behavior of Moon jellyfish is a target of research, it probably has to be performed in the ocean (Fig.1), not on the beach (Fig.2). Figure 1. 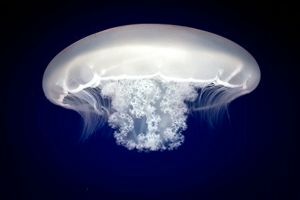 Moon jellyfish in ocean. Photo by Flickr user: Mason Bryant,-- under CC-BY-SA 2.0 license. Accessed on 02/12/2009. Figure 2. Moon jellyfish on sand. Photo by Flickr user: Somebody's Mom,-- under CC-BY-NC-ND 2.0 license. Accessed on 02/12/2009. Similar preference is often relevant to the (sub)nanoscale studies. For example, if lipid bilayer is formed under the aqueous medium, more reliable results can be obtained if observation is made in the same medium, preferably in situ (during the bilayer formation). If adsorption of polymer molecules occur in liquid, it is again worth to be studied in the same liquid. Atomic force microscopy (AFM) described in details at this site provides unique opportunity of under-liquid-3D-visualization of extremely small objects. However, essentially similar to the imaging under air atmosphere, AFM under liquids needs more experience. Various liquids can be used in such studies: water, alcohols, aliphatic solvents, various solutions, etc. In contrast to AFM, other high resolution techniques either do not provide direct visualization (e.g. nuclear magnetic resonance, small-angle X-ray scattering) or can't work under liquid media (e.g. transmission and scanning electron microscopy). There is one even more surprising fact. It is often preferable to perform very subtle AFM measurement under liquid even if the study under air is acceptable! Why? Because measured samples are often covered with about 1 nm adsorption layer of water. That means that the shape of the objects which hhave similar thickness can be significantly distorted or the objects themselves may be even changed interacting with water. 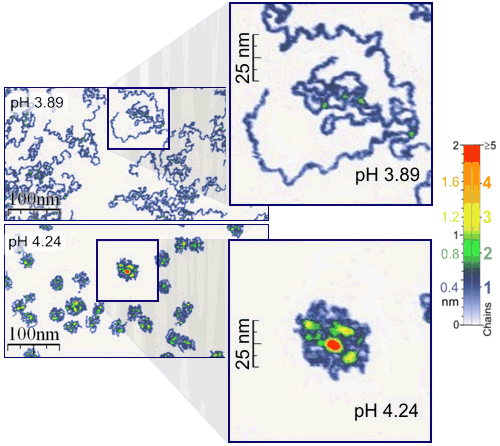 Good example, which benefits from the both mentioned advantages of under-liquid-studies, is an AFM study of the adsorption and behavior of single polymer molecules (Fig.3). Figure 3. Single polymer molecule resolution of AFM. Measurements were performed under the aqueous media of different pH values, corresponding to the addition of ~0.0025 g of pure hydrochloric acid per 1000 g of water (from pH 4.24 to pH 3.89). Details can be found in: Roiter, Y.; Minko, S. J. Am. Chem. Soc. 2005, 127(45), 15688-15689. See also corresponding information in Wikipedia (last accessed on 02/12/2009). The single molecule experiment was performed under the aqueous media of different pH values (different amount of added acid). It was found that a very subtle change of pH is needed to induce drastic changes in the conformation of polymer chains. Such a subtle observation would be hardly possible if the samples were dried. In addition, the pH of the adsorption layer of water on the sample would certainly be different from the media applied for polymer adsorption. It is worth to notice here that this is a study of the polymer adsorption, not exact conformation of molecules in solution, which can be provided by fast drying process (Fig.4). In contrast, during the adsorption process, molecules interact with the surface and may change the conformation. Figure 4. Spin-coating of single molecule sample for AFM-imaging under air. Movie represents projection of molecule followed by fast drying of the solvent. Roiter, Y.; Jaeger, W.; Minko, S. Polymer 2006, 47(7), 2493-2498. The "absence" of adsorbed layer of water in the images recorded under the water allowed to find exact thickness of poly(2-vinylpyridine) chains. It was found to be about 0.4 nm (4 Angstrom!) shown by blue color in Figs.3,5. The thickness of two chains placed one on top of the other is 0.8 nm (green color in Figs.3,5) and so on. If measurements were performed under air, the layer of adsorbed water would make such accuracy impossible. Figure 5. Appearance of real linear polymer chains as recorded under liquid medium. and Roiter, Y.; Minko, S. J. Phys. Chem. B 2007, 111(29), 8597-8604. See also corresponding information in Wikipedia (last accessed on 02/12/2009). In some cases, the advantages listed above become the necessity. One case in this category is a study of precise details of lipid bilayer formation on nanostructured surfaces. Such details may be observed only in situ during the formation of lipid bilayer (Fig.6). of the series of AFM images with subtracted initial image (left) obtained during the lipid bilayer formation. Details can be found in: Roiter, Y.; Ornatska, M.; Rammohan, A. R.; Balakrishnan, J.; Heine, D. R.; Minko, S. Nano Letters 2008, 8(3), 941-944. The study allowed to determine that 5 nm thick lipid bilayer is capable to follow the topography of particles below 1.2 nm and above 22 nm in diameter placed onto flat surface. The transmembrane pores (or holes) were found in lipid bilayer formed around particles of 1.2 to 22 diameter. This finding elucidates some questions of the nanoparticle cytotoxicity (penetration of nanoparticles into cells) and allows for the design of specifically nanostructured (patterned) surfaces partially protected by supported lipid bilayer. Currently we perform AFM studies under n-decane, ethanol, and ethanol-water media that soon will appear in press. Sergiy Minko, Egon Matijevic Chaired Professor, D.Sc., Clarkson University. Leader of Nanostructured Materials Group, Principal Investigator. Yuri Roiter, Research Assistant Professor, Ph.D., Clarkson University. Expert of AFM Studies in Liquid Media, Developer of Software for AFM Studies. The studies of single molecules were supported by the North Atlantic Treaty Organization under NSF Grant DGE-0411649 awarded in 2004. Lipid bilayer study was supported by Corning Inc. and NY Center for Advanced Materials Processing at Clarkson University. S.M. and Y.R. thank Dr. Akhremitchev (Duke University) for help with design of custom-built temperature stage for AFM studies.